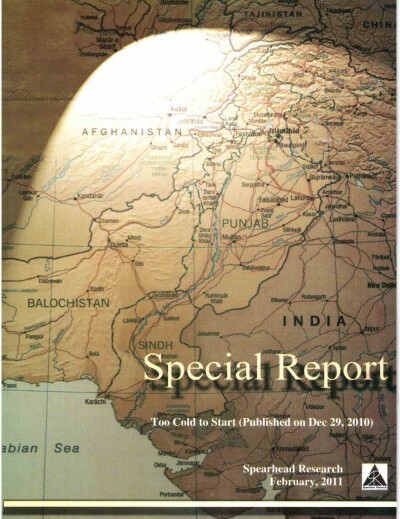 You are here: Home › Security › Is the BJP India’s New Hegemon? Four years after coming to power in New Delhi, India’s ruling Bharatiya Janata Party (BJP) is methodically crafting a new political hegemony. This newfound predominance, as argued by political scientist Suhas Palshikar in a recent issue of the Indian social science journal Economic and Political Weekly, is built on two foundational pillars: elections and ideology. First, in electoral terms, the BJP has become the central pole around which politics in India revolves. Its historic victory in the 2014 general election—coupled with an impressive string of state election triumphs over the past four years and an expansion of the party’s social base—has transformed the party from merely competitive to markedly dominant. Second, the BJP has also managed to exert its dominance ideologically. With its twin emphasis on Hindu nationalism and a “new developmentalism,” the BJP has saturated the world of ideas at a time when the Indian National Congress’s legacy of secular nationalism has fallen out of favor. The BJP’s electoral and ideological dominance have, of course, been propelled by the standing and sustained popularity of incumbent Prime Minister Narendra Modi. Palshikar is principally concerned with the BJP’s nascent ideological hegemony, but its progress in the electoral domain is equally important. The decisive single-party parliamentary majority it earned in 2014 arguably represents a critical juncture in the evolution of India’s party system. And while the party’s rise over the past four years is unmistakable, equally stunning is its principal rival’s change in fortunes. The Congress Party’s loosening grip on state assemblies has, not surprisingly, coincided with a serious drop in its share of state legislators—who are influential cogs in India’s federal polity. The story is the same in the Rajya Sabha, the upper house of parliament, whose members are chosen by the respective state assemblies. The BJP and its allies, meanwhile, have been steadily picking up steam. Collectively, these data suggest that the BJP appears to be playing the role of a hegemonic power. Like the Congress before it, the BJP’s present position has a system-defining quality. Both state and national elections are regularly fought in reaction to the BJP (either in favor or in opposition). Indeed, as 2019’s general election race heats up, opposition parties are hastily engineering a common anti-BJP front. However, the BJP’s emerging hegemony should not be conflated with electoral invincibility. As recent elections have demonstrated in states such as Bihar, Delhi, and Karnataka, the party is fallible. Furthermore, its ability to replicate in 2019 the electoral rout it achieved in 2014 looks unlikely given the burden of anti-incumbency in India as well as the Modi government’s mixed economic track record. Therefore, future electoral setbacks are a distinct possibility. However, while the BJP’s amassed political influence will certainly ebb and flow, it will not fade easily. 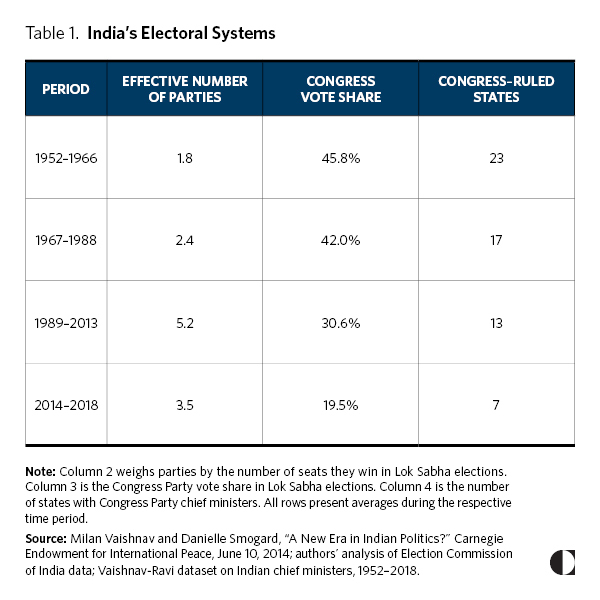 Conventional accounts disaggregate elections in postindependence India into three distinct phases, or “electoral systems,” to borrow a phrase coined by the academic and politician Yogendra Yadav (see table 1). The first phase, which commenced in 1952 with India’s first general election, was distinguished by the Congress Party’s dominance. While state and national elections were competitive—they were hotly contested by a multitude of parties—the opposition to the Congress was deeply divided. This limited the opposition’s ability to depose the Congress in New Delhi and in most state capitals. The year 1967 heralded the dawn of India’s second electoral system. Between then and 1989, Congress maintained is monopoly on power at the center (with the brief exception of the post-Emergency period from 1977 to 1979, when the electorate punished the Congress Party for suspending basic democratic freedoms for a twenty-one-month period), but its grip on state-level power eroded considerably. Congress found it difficult to ward off new regional and caste-based groups frustrated with the umbrella party’s internal contradictions. Nevertheless, Congress remained the default governing party, and elections often acted as a referendum on its performance. WAS 2014 THE DAWN OF A FOURTH ELECTORAL SYSTEM? Most election analysts believed the 2014 general election would fit the prevailing pattern because they thought coalition governments in New Delhi were inevitable for the foreseeable future. However, the BJP’s dominant performance—earning the first single-party majority in three decades—and the humbling of the Congress Party opened up the possibility that a new, fourth electoral phase had been inaugurated. Overwhelming even its own, most optimistic projections, the BJP secured 282 out of 543 seats in the Lok Sabha, the lower house of parliament—exceeding the majority threshold by a comfortable margin. The addition of another 53 seats courtesy of the BJP’s National Democratic Alliance (NDA) allies was mere icing on the cake. The Congress’s drubbing, in which it claimed a paltry 44 seats, represented its worst electoral showing since independence by a large margin (its previous low was 114 seats in 1999). 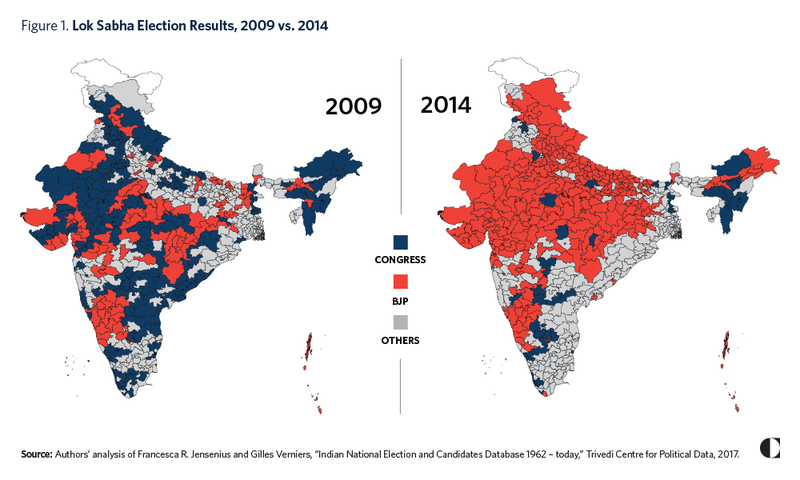 This represented a dramatic sea change from the general election in 2009, when the Congress had won 206 seats and the BJP’s tally of 116 proved a distant second (see figure 1). While the bulk of the BJP’s seats came from a limited number of states—eight states in north-central India accounted for 75 percent of its parliamentary tally—the party’s 2014 performance broke new ground in several other respects. First, the BJP and its allies won 104 out of 120 seats in the populous Hindi heartland states of Bihar and Uttar Pradesh. These are fragmented, multi-party states unlike Gujarat, Madhya Pradesh, or Rajasthan, which feature bipolar competition between the Congress and the BJP. In both Bihar and Uttar Pradesh, powerful regional parties usually jockey with national parties for political space—which makes the BJP’s success even more noteworthy. Second, the BJP markedly improved its performance in India’s northeast states—consisting of Arunachal Pradesh, Assam, Manipur, Meghalaya, Mizoram, Nagaland, Sikkim, and Tripura—where it has traditionally had a modest presence. In 2014, the BJP earned an average vote share of 28 percent in these states, notching eight seats (out of twenty-five on offer). Compared to the previous election in 2009, the BJP doubled both its vote and seat shares. Two decades ago, the Congress earned 40 percent of the vote and held thirteen seats in this region; today, its shares are down to 30 percent and eight seats (virtually identical to the BJP’s position). 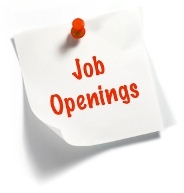 Jayaram Ravi is an undergraduate student at Stanford University and a former Carnegie intern. Third, the BJP also improved in key states where its performance had recently fallen off. In Jammu and Kashmir, for instance, the BJP claimed as much as 32 percent of the vote and two of six parliamentary seats back in 1999. A decade later, the party won zero seats—managing only 19 percent of the vote. In 2014, it regained its 32 percent vote share and bagged three seats. In Odisha and Tamil Nadu, the party recaptured some of the ground it had ceded in the last two decades. The BJP has traditionally been a minor player in West Bengal, but it won as many seats (two) as the Left Front—which has been a powerful force in the state’s politics for decades. Additional evidence further suggests that India’s third electoral system may be ending. A few core principles marked this system during national elections: rising political competition, declining margins of victory, falling voter turnout, and the federalization of national politics. Each of these exhibited at least a modest reversal in the 2014 poll.1 Most importantly, between 1989 and 2014, Indian politics lacked a dominant party. In contrast, the 2014 race culminated in a national wave favoring the BJP and frustrating the Congress. Whereas most national elections since 1989 have often been the sum of state contests, the 2014 poll had the flavor of a nationwide plebiscite. This prospect of a fourth electoral phase in India’s postindependence life would see the BJP become the central gravitational force in Indian politics. Of course, it is premature to conclusively state that the third phase is over and done with; these assessments are easier in hindsight. However, the 2014 election results, coupled with changes at the state level and within the Rajya Sabha (whose makeup hinges on state-level dynamics), show the contours of an emergent new phase more clearly. Jamie Hintson is a James C. Gaither junior fellow with Carnegie’s South Asia Program. The seismic changes heralded by the 2014 general election would soon manifest in state politics. Prior to the 2014 poll, BJP chief ministers ruled in five states (the BJP’s allies controlled another three), and the largest number of states the BJP had ever controlled was seven (achieved in 2012). As of September 2018, the BJP rules in fifteen of India’s twenty-nine states while its coalition allies call the shots in another five (see figure 2). During the BJP’s previous stint in power under the late prime minister Atal Bihari Vajpayee, the number of states it directly controlled fluctuated between four and six. 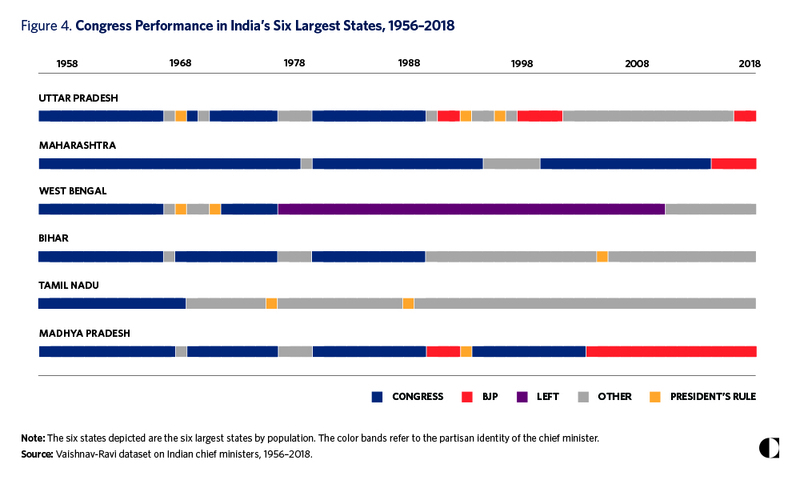 Source: Vaishnav-Ravi dataset on Indian chief ministers, 1956–2018. Contrast the BJP’s growth in state-level control with the Congress’s corresponding decline between 1962 and 2018 (see figure 3). In state elections held between 1962 and 1967, the median Congress vote share was 41 percent. Over time, that number has gradually declined; for elections held between 2016 and 2018, the median Congress vote share was around 29 percent. 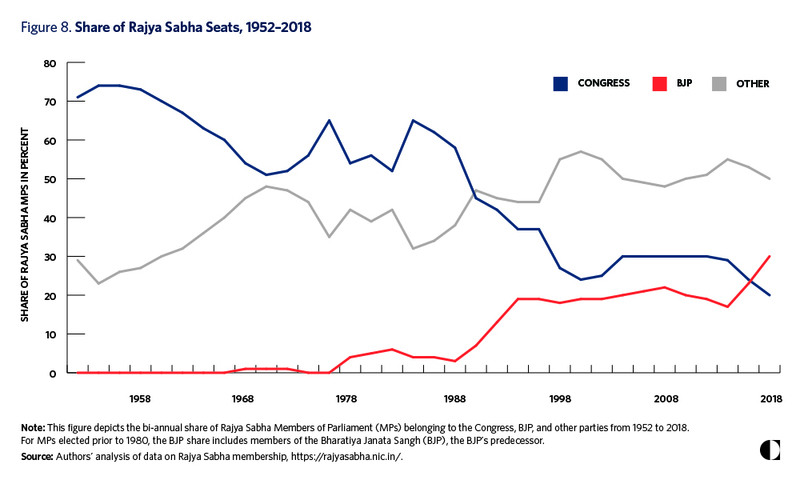 The decline is less stark in the seats the Congress actually contested (this metric does not penalize the Congress for constituencies it did not contest or allocated to a coalition partner). 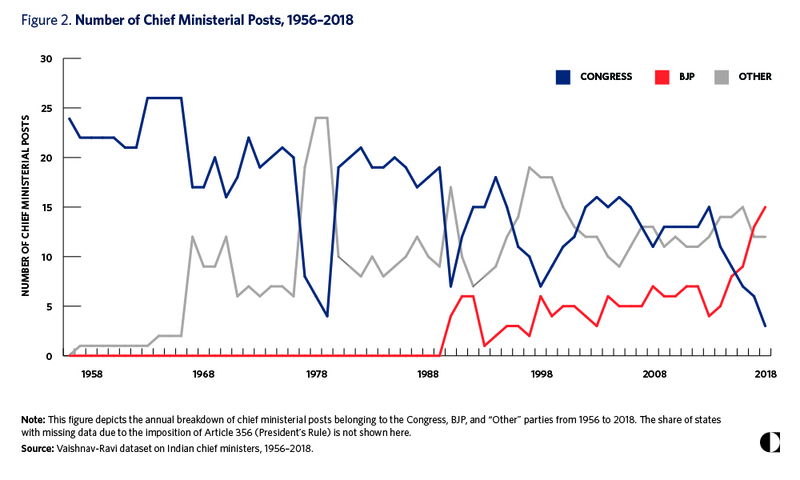 Using this restricted measure, the Congress vote share has declined from 42 percent in 1962–1967 to 36 percent in 2016–2018. But this tells its own story: the share of seats the Congress contests has declined as the party either has been proved electorally uncompetitive in certain areas or was compelled to join hands with a local coalition partner. In the early 1960s, the Congress contested as many as 95 percent of seats on offer. Between 2011 and 2015, that figure dipped to 81 percent. In the most recent elections (2016–2018), that percentage had fallen even further to 63 percent. Today, Congress chief ministers rule in just three states—the party’s smallest tally in history. Its previous low was four states in 1979 as it reeled from the aftershock of Emergency Rule. It is clear from the state-level data that the BJP’s gains in recent years have largely come at the expense of the Congress. Indeed, the two parties’ trends serve as mirror images. The footprint of other parties (as shown in figure 2) has been fairly stable at least since 2006. While the BJP’s retention of the states it currently controls is by no means assured, the Congress Party’s infirmities are easily discernible. 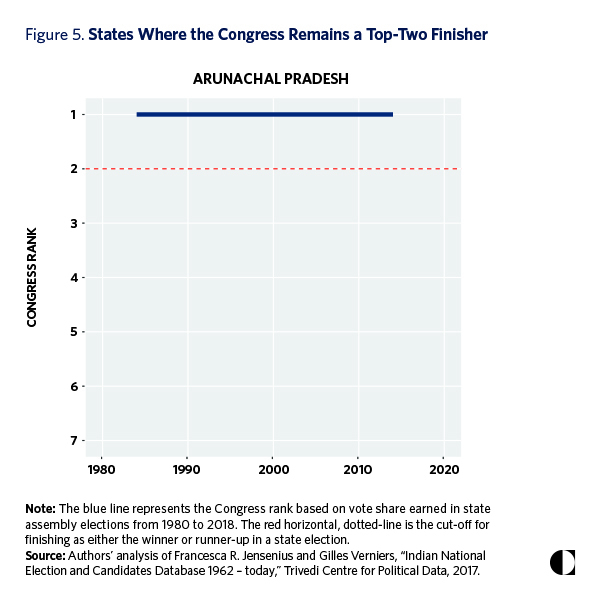 First, the Congress is nowhere to be found in India’s six most populous states—Uttar Pradesh, Maharashtra, West Bengal, Bihar, Tamil Nadu, and Madhya Pradesh (see figure 4). From 1956 to 1966, the Congress enjoyed a monopoly in these states. While it took a backseat to the main Dravidian parties in Tamil Nadu thereafter, the party retained control in four out of six into the late 1980s. Yet with the exception of Maharashtra, where the Congress led the government between 2000 and 2014, it has since been decisively shut out of the other five. In the short run, Maharashtra and Madhya Pradesh are the only two where the Congress has a plausible shot of returning to power. Third, in certain regions of the country, the Congress organization has simply melted away. India’s northeast is a good example of this shift. 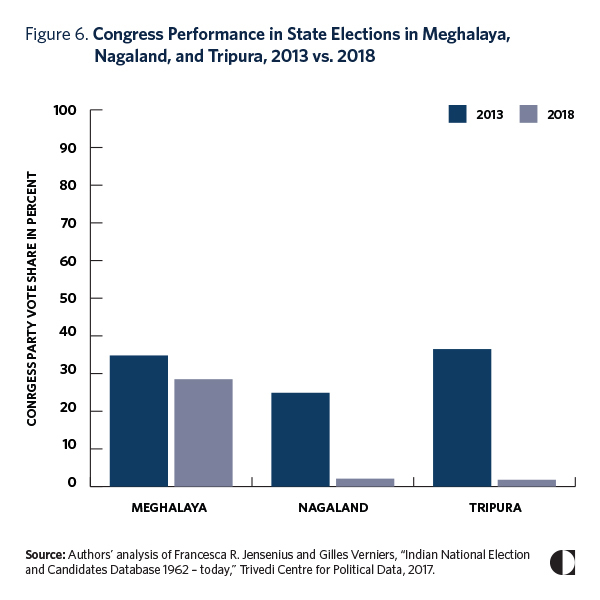 In three recent assembly elections (in the states of Meghalaya, Nagaland, and Tripura), the Congress Party’s performance tumbled—especially in the latter two (see figure 6). In 2013, the Congress won 25 and 37 percent of the vote, respectively, in Nagaland and Tripura. Five years later, its vote share stood at a startling 2 percent in both states and it won precisely zero seats. In contrast, its performance in Meghalaya—where its seat tally declined from twenty-nine to twenty-one (out of sixty members) and its vote share dipped from 35 to 29 percent—seems downright cheery. 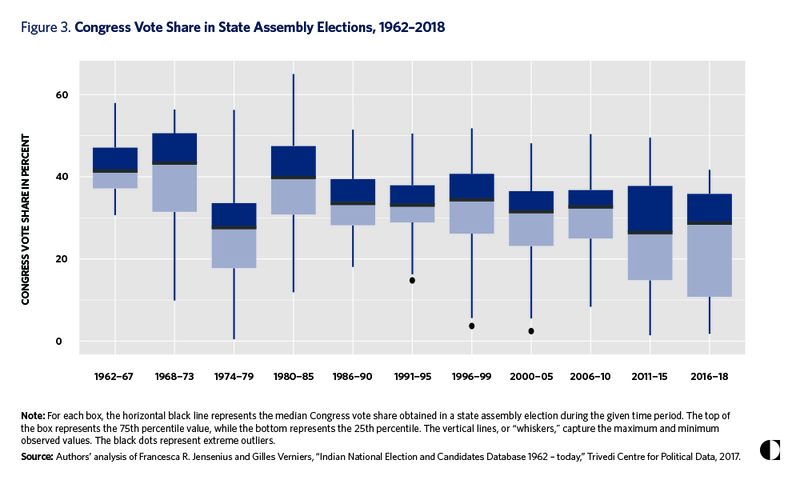 A corollary of the BJP’s improved position in the states is its increased share of state legislators, known as members of the legislative assemblies (MLAs). Under India’s federal constitution, states have significant responsibilities for matters of day-to-day governance. As a result, MLAs are influential power brokers who regularly mediate relationships between citizens and the state. The BJP began contesting elections in 1980 as a party (its predecessor, the Bharatiya Jana Sangh, was active in politics from 1951 to 1977). In its early years, the BJP was a bit player (see figure 7). For most of the 1980s, it accounted for just 5 percent of all MLAs across India—a miniscule number when compared to the Congress and regional parties. During the early 1990s, when the BJP first grew in prominence, its share nearly managed to crack 20 percent. Although it plateaued there for much of the 1990s, it broke into the low 20s thereafter. There was a clear pickup following the landmark 2014 general election and Modi’s ascent to power, when the BJP share grew to 25 percent and finally overtook the Congress. Within four years, it would cross 35 percent; the last time the Congress had claimed that many state legislators was in 1993. Today, the Congress share of MLAs stands at 19 percent—its lowest level since 1980. 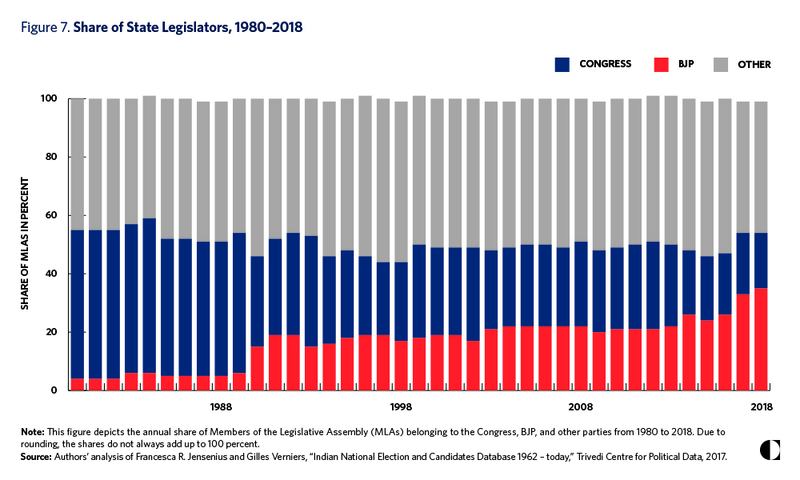 Less recognized is the fact that the number of legislators belonging to neither party is at its lowest level in almost thirty-five years (around 45 percent in 2018). This decline is largely driven by changes in a handful of states. In Uttar Pradesh, for instance, parties other than the Congress and the BJP had 328 MLAs in 2012 compared to 84 in 2017—the same year that the BJP won a three-fourths majority in the state’s election. Bihar has also seen a sharp decline in the representation of regional parties in the last decade while Karnataka has witnessed a gradual decline since the 1980s. The BJP’s expanded presence in the states has obvious ramifications for the composition of the Rajya Sabha, whose members are indirectly elected by the respective state assemblies. These elections occur on a staggered calendar, with one-third of members up for reelection every two years. When the BJP swept to power in the Lok Sabha in May 2014, it remained a distinct minorityin the Rajya Sabha (see figure 8). Divided control of the two parliamentary chambers made the BJP unable to unilaterally enact its legislative agenda without making common cause with the opposition. At the start of the Modi government’s tenure, the BJP claimed only 17 percent of seats in the upper house, compared to 29 percent for the Congress (with the balance held by other parties). In 2017, for the first time, the BJP’s tally surpassed that of the Congress. The BJP’s share has steadily risen to 30 percent while the Congress share has plummeted to 20 percent. When the BJP’s NDA allies are included, its current share of seats rises to 37 percent (the corresponding share for the Congress’s United Progressive Alliance is around 27 percent). Despite the BJP’s improved standing in recent years, it still lacks a governing majority in the upper house. According to one recent analysis, the NDA will probably not achieve an outright majority until at least 2024. Yet any predictive analysis of this type is invariably based on a number of uncertain assumptions. Suffice it to say that, with its recent gains, the BJP is in the strongest position it has ever been in the Rajya Sabha. If it is able to corral support from parties not aligned with the United Progressive Alliance, it would be positioned to enact legislative changes by a simple majority. However, constitutional amendments, which require a two-thirds majority, would still need broad, cross-party consensus. Since 2014, the BJP has actively reshaped India’s political landscape to its benefit. Its crowning achievement—earning a single-party majority in the 2014 Lok Sabha elections—would prove to be the commencement, rather than the conclusion, of a systematic partisan tilt in the country’s politics. The BJP has built on its general election performance to expand its electoral footprint at the state level. This has positively benefited its tally of state legislators as well as its presence in the Rajya Sabha. As noted at the outset, the crafting of any new hegemony has an ideological component as well as an electoral one. The data compiled here indicate the party has taken great strides toward electoral hegemony. Yet hegemony does not mean the party is immune to electoral setbacks; such defeats are inevitable—especially where the opposition can act collectively and forge workable, counter-BJP alliances. But after a few decades without a dominant party, the situation today represents an important new chapter in India’s political evolution. If the BJP’s rise does not continue much further, perhaps the most apt analogy is India’s second electoral system. In this system, the Congress occupied a position of dominance but encountered stiff opposition at the state level and regularly lost key state elections when confronted with a unified opposition. However, if the BJP’s juggernaut continues apace, India could return to one-party dominance akin to the heady days of the “Congress system”—this time, of course, with the BJP assuming the Congress’s mantle. The implications for the political system at large are several-fold. First, the BJP’s rapid pickup of states will provoke opportunistic alliances forged by desperate opposition parties. Indeed, that process has already begun. In recent by-elections in Uttar Pradesh, the Bahujan Samaj Party and the Samajwadi Party—long-standing bitter rivals that have vied for political dominance in India’s most populous state for a few decades—set aside their differences to unite in a successful effort to defeat the BJP. Other such marriages of convenience will likely arise in the run-up to the 2019 general election. Second, the Congress faces two somewhat contradictory objectives as it looks ahead. Its first goal is to stem its electoral decline. And its second goal is to build up its emaciated party organization. Unfortunately for party leaders, the two are in tension. In order to improve the party’s short-term fortunes in states with multi-party competition, the party has decided to forge alliances with key regional players. However, this likely means it will struggle to reclaim political territory it cedes to others. The party’s decision to form an eleventh-hour coalition government with the Janata Dal (Secular) after the May 2018 Karnataka assembly elections is a harbinger of things to come. Third, the BJP has not been universally successful in expanding its footprint. 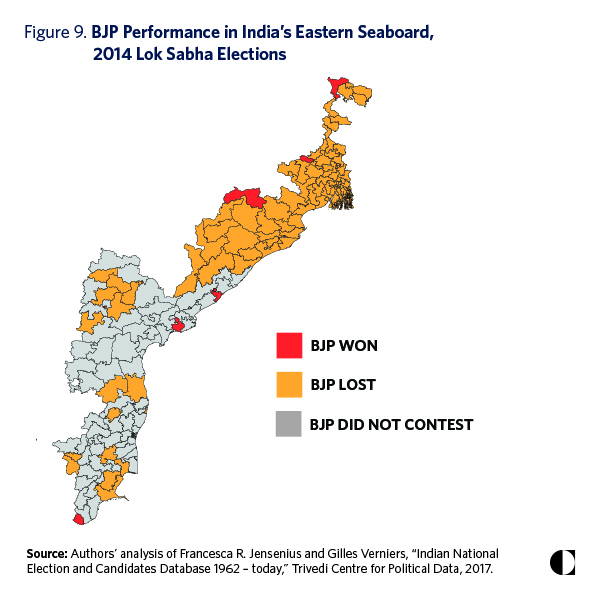 India’s eastern seaboard (stretching from West Bengal in the north to Tamil Nadu in the south) remains relatively immune to the BJP’s charms (see figure 9). The party has placed significant emphasis on making fresh inroads in precisely these states in the coming election. BJP leaders hope that gains in these states could compensate for potential losses in states it swept in 2014—a feat that is difficult to replicate. Fourth and finally, the BJP’s hegemonic status cannot be easily separated from Modi’s own popularity. In nearly all states where the BJP has come to power since May 2014, it has done so without formally projecting a chief ministerial candidate. Instead, it has campaigned on Modi’s own standing. This works well when the prime minister polls better than his party, but the time might come when Modi’s star dims. In May 2017, according to data collected by Lokniti, 44 percent of Indians named Modi as their preferred prime minister. One year later, that share had fallen to 34 percent. To be fair, in May 2014, when the BJP earned its historic general election victory, only 36 percent of Indians surveyed named Modi as their top choice. So Modi has not lost much ground compared to four years ago, but if this percentage continues to drop further, it would ring alarm bells within the BJP. The Congress Party under former prime minister Indira Gandhi banked on a similar strategy during the her heyday in the 1970s and early 1980s. The long-term fallout of this strategy is borne out by the data presented here. Today’s hegemonic force in Indian politics would do well to learn the lessons of its predecessor if it wishes to avoid a similar fate. 1 While the number of parties contesting national elections continued to grow, the “effective number of parties” (a statistic that weighs parties by the number of seats they actually won) fell to its lowest level since 1984. Individual races also were significantly less competitive in 2014 than they were in 2009. In 2009, the average margin of victory in a parliamentary election (that is, the difference in vote share between the winner and runner-up) was 9.7 percent. In 2014, it stood at 15.2 percent—a testament to the BJP’s rout of the Congress. In terms of voter turnout, 2014 witnessed record participation at the polls: 66.4 percent of the electorate cast their ballots, in contrast to approximately 59 percent in the two previous contests in 2004 and 2009. 2 The same patterns hold true for the state-level Congress performance in Lok Sabha elections.